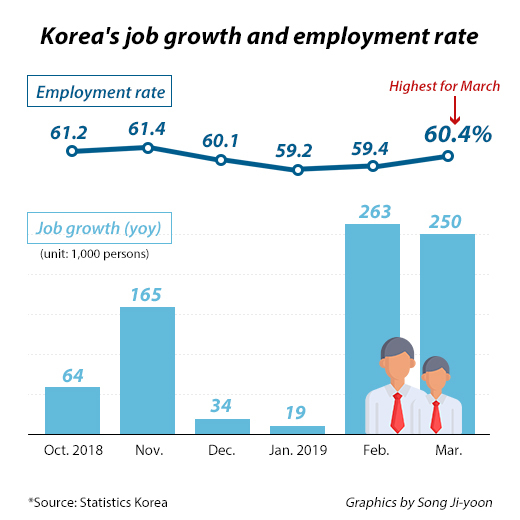 South Korea added more than 200,000 jobs for the second consecutive month in March, and the number of jobless people declined for the first time in nine months, mainly led by the aggressive addition of state jobs. According to data released by Statistic Korea on Wednesday, the number of employed people in March stood at 26,805,000, up 250,000 from the same month a year ago. The number of new hires exceeded 200,000 for two months in a row following 263,000 in February, raising hopes for a possible recovery in the country’s job market after a lengthy slump since February last year when the job gains had slowed down to 104,000. In January this year, a mere 19,000 jobs were added. Thanks to the state-sponsored program to create new jobs, job addition in the healthcare and social welfare service sector grew 8.6 percent from the previous year to 172,000 in March. The science and technology service industry added 83,000 jobs and agricultural and fishery sector 79,000. The manufacturing sector, however, lost 108,000 jobs, maintaining the downward trend for the 12th straight month. Job loss in the business support and renting service industry amounted to 42,000, and the financial and insurance sector 37,000. The statistics bureau said the semiconductor and electronics equipment makers are feeling the worst slump among local manufacturers, but the pace of job loss has slowed down since January. Job conditions would improve if their business conditions get better, it added. The employment rate for people aged 15 or older edged up 0.2 percentage point from a year ago to 60.4 percent in March, the highest figure for March since July 1982 when monthly data became available. The employment rate rose in every age group except for those who in their 40s that showed decline for 14 months in a row since last February. 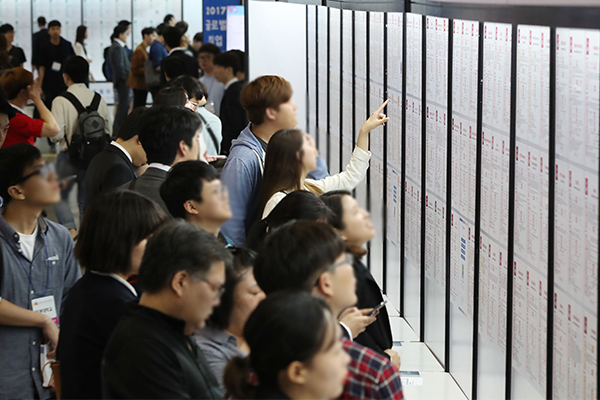 The number of Koreans out of work fell 4.8 percent on year to 1,197,000 in March, the first drop since June 2018. The jobless rate slipped 0.2 percentage point to 4.3 percent. The unemployment rate for people aged between 15 and 29 also decreased 0.8 percentage point to 10.8 percent.